The ZX55U-5 5 tonne mini excavator by Hitachi simple maintenance, an impressive operator’s cab and high performance hydraulic systems. 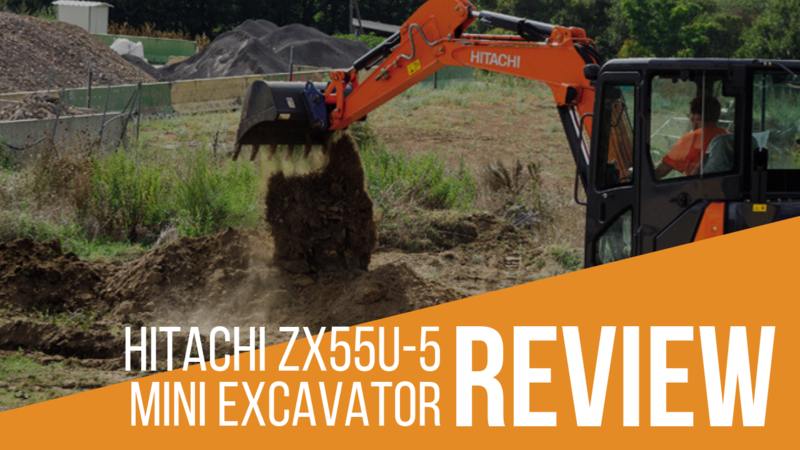 The ZX55U-5 Hitachi mini excavator packs a punch when it comes to handling excavating jobs with ease. Combining operator safety and comfort with a high-performing, well-built front attachment, it delivers the quality you'd expect from the Japanese construction machinery behemoth – Hitachi. It's time to discover why you need this 5 tonne excavator on your site. As a contractor on the hunt for your next digger, you'd be making a wise choice with this Hitachi mini excavator. It's high on the list of Hitachi excavators Australia that you can use with confidence, mostly thanks to its robust build, excellent fuel efficiency and thoughtful cab design. It's not as powerful as other mini excavators out there, so if you've got a big job on your hands it's worth looking at our other reviews to check out other excavator hire possibilities. Saying this, the ZX55U-5 5 tonne excavator is still more than capable of tackling a multitude of construction missions with its rugged box-section blade. In fact, the box-section blade is one of my favourite features for rental companies as it improves job efficiency: the openings in its stays ensure that mud flow-out is simple. It's ideal when you need your 5 tonne digger to do the work quickly without getting stuck in tougher conditions. 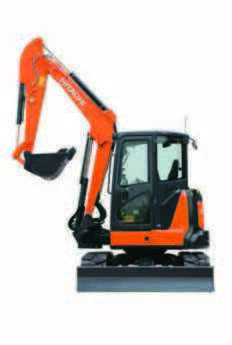 Its superior fuel efficiency also makes this Hitachi excavator Australia's top hire pick. The ZX55U-5 comes equipped with two modes to suit your needs, depending on the job - simply select the engine's 'ECO' mode if you need to save fuel, or choose 'PWR' for the boost your dig needs. This comes in addition to the Hitachi mini excavator's 'Auto Idle' feature, which drops the engine into idling mode four seconds after you've moved the control lever into neutral. Making the most out of your excavator hire is a priority, especially financially, so this 5 tonne excavator is one of my hire champions for this reason alone. Every rental company wants a machine that is easy to maintain, and this is another factor in my fondness for the Hitachi mini excavator ZX55U-5. It couldn't be easier to carry out maintenance on this 5 tonne excavator thanks to open-wide covers, a cab floor with increased accessibility for cleaning, and sloped frame tops which provide simple mud removal. Open-wide covers allow instant access to this 5 tonne digger's service points, so you can check out your hire quickly and easily to keep it running as efficiently as possible. This extends to the refuelling with a lightweight tank cover and large toolbox included, so you don't need to worry about excess hire downtime. Muddy floor? The mini ZX55U-5 Hitachi excavator's split-type mat is easily removed and has patterns designed to aid quick cleaning for smooth replacement. 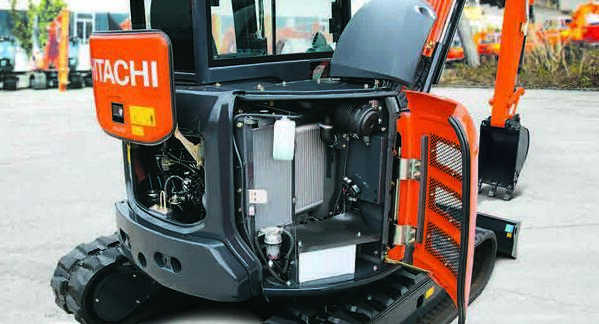 The ease of cleaning extends beyond the cab floor, with the radiator and floor arranged parallel rather than in-line. This unconventional arrangement makes for easy cleaning via air-blowing. Even if mud is present, the track frame tops slope so that mud slides away quickly, letting operations move forwards without hassle. 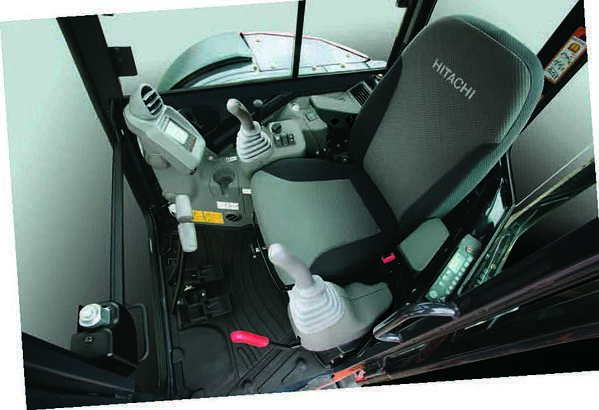 As you'd expect from Hitachi, operator comfort is prioritised in the ZX55U-5 cab's thoughtful design. The cab door width has been increased by 80mm and the windshield has been enlarged to ensure that visibility is prioritised. The cab's structure offers added protection, with the OPG (Operator Protection Guard) ensuring drivers aren't at risk of being hit by falling debris. The 4-pillar canopy of this Hitachi excavator also utilises ROPS (Roll-Over Protection Structure) so that if tipping does occur, the operator will still be safe. Additional safety features included by Hitachi are the neutral engine start system which prevents the engine from starting up if the lever is not in lock position. As standard, the ZX55U-5 5 tonne digger is fitted with a seat belt, swing parking brake, pilot control shut-off lever and travel parking brake. 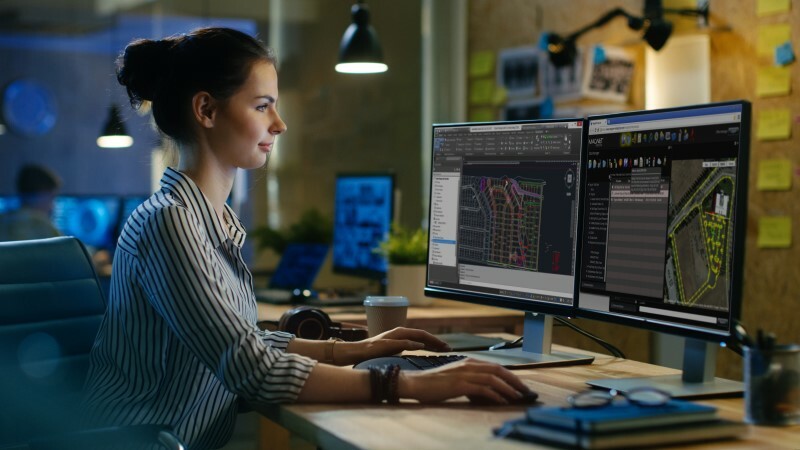 High technology carries through into the cab's multi-monitor, with an easily readable bright screen to inform the operator of the excavator's machine condition. Displaying useful info such as whether ECO or PWR mode is in use, the screen makes controlling the Hitachi mini excavator an even more user-friendly and comfortable experience. The Hitachi excavators Australia ensure their diggers operate on need systems like the HHH to provide consistent, efficient operation. 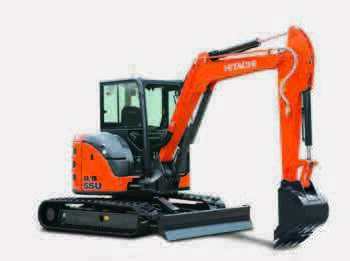 HHH - Hitachi High-performance Hydraulic - ensures that, regardless of the load, lever control is smooth and stable. HHH is not the only impressive feature of this 5 tonne digger's control system. The control lever is positioned ergonomically and has low-effort handling to reduce operator fatigue. When dealing with awkward terrain, its auto speed change system adapts to the environment, with travel speed altered when load limit is exceeded - so, when travelling downhill - and when the load is lessened. I've already mentioned the rugged box-section blade which perfectly pairs efficiency and durability. Other durable features that make this mini Hitachi excavator stand out include its strengthened front attachment and sturdy structure. The front attachment has been reinforced with tight fit front pins, which have in turn been lubricated with HN bushings. This combination reduces noise and jerking and, with grease-retaining capacity increased to 500 hours, you can be confident that this 5 tonne excavator will stand the test of time. When it comes to the structure of the ZX55U-5, it's not just the cab's ROPS and OPG that matter: the upper structure frame has been carefully reinforced with D-section skirts that have increased height for a larger cross section. This increases durability against obstacles, improving work efficiency and handling capabilities. 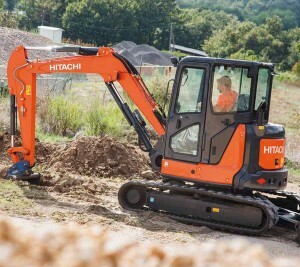 Looking to find your next Hitachi mini excavator to hire? 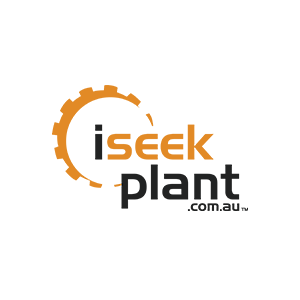 iSeekplant is Australia's favourite plant hire equipment provider for the mining and civil construction sectors. 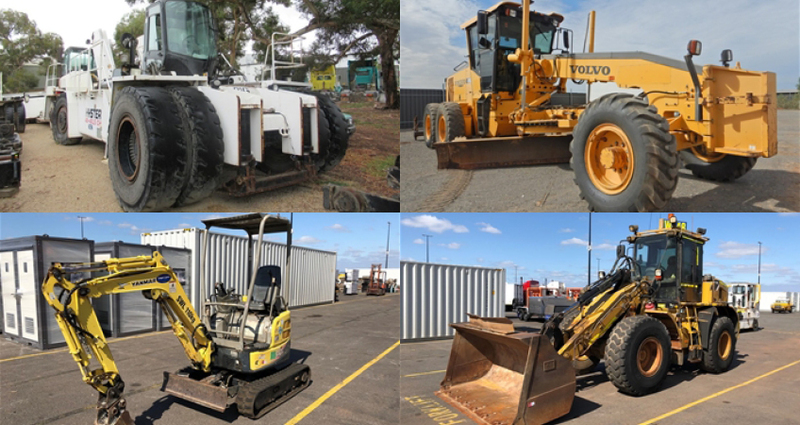 Get in touch with us today on 1300 691 912 to let us match you with your ideal construction equipment hire provider. Alternatively, run a search for a mini digger to hire here.